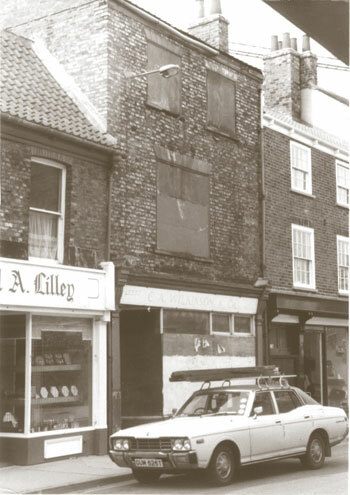 This property was acquired by the Trust in 1980 and consists of a ground floor shop with two self-contained flats above. Two rooms on the first floor have ceiling roses in situ, though 19th century conversion has meant that the floor is almost entirely one large room. The far side of a party wall with No. 19 contains timber-framing which is not structurally part of either house, and is a survival of a much earlier building on the site of the front range of No. 17 and 19, probably of the 16th century and belonging to the extensive buildings owned by Alderman Holme in 1542 on the site of numbers 15 to 25. By 1561 these had been split into two properties. When built, the house may have been of only two storeys and an attic. The extensive alterations in the first half of the 19th century have meant that the only older features left are the staircase, and parts of the brick walls of the rear and side elevations. On the north-west wise are blocked arched windows. 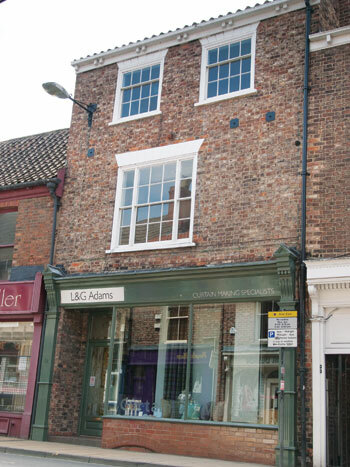 Everything visible from the street, above the modern shop front, is of early 19th century date. Again, the brick walls are in Flemish Bond, and the hung sash windows have stone or stuccoed rusticated lintels. The first floor has a three-part window, double-sashed, with six panes per sash; the two windows on the second floor are smaller. At the rear the building drops to two storeys and attic, gabled to the south-west. The rear brickwork has been patched, but is mainly of 18th century date. In the south-east wall of the large 34 foot first-floor room is a small hob-grate fireplace, with corner roundels to the surround, dating from the middle of the 19th century. The staircase of circa 1750 rises only to the first floor. Each tread has two turned balusters with square knops and plain shaft.